At Fielder and Associates Landscape and Specialty Company we know there is more to a good landscaping plan than just designing for aesthetic appeal. Our expert designers use their knowledge to create the landscape that is not only visually attractive but optimizes the outside space usage. We build settings that will also block unsightly views, reduce noise, and cut down heating and cooling costs. 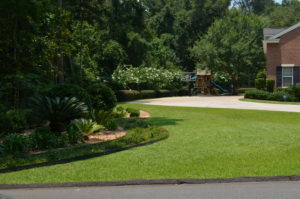 The number one goal at Fielder and Associates Landscape and Specialty Company is to complete every project with impeccable quality and customer service. You can feel confident knowing that your project will be completed on time and on budget. Throughout the project we combine flawless project management, cooperation, and flexibility to ensure a seamless process right up to and including completion. Right from the beginning we will work with you to design, plan and install the landscape that is suited to your specific property and business. We look forward to working with you. Give us a call at 850-224-5263.